Though some students may be struggling with the stresses that the end of the semester brings, Pitt athletes weren’t cracking under the pressure over the weekend. Track athletes continue to set personal bests, the baseball team improved on their impressive win percentage and the softball team registered a historic victory. On the first day of competition in the Colonial Relays held in Williamsburg, Virginia, the Panthers saw success in distance events. Senior Rebecca Peters claimed the first victory of her career in the women’s 5000m race with a time of 16:57.94. Three other runners finished top-10 in the distance events. Junior Miranda Salvo took eighth in the 800m with a time of 2:11.50 after winning her heat. Sophomore Dante Wilson placed fifth in the men’s 800m with a time of 1:51.48. Senior Melanie Vlasic finished seventh in the women’s 3000m steeplechase while setting a personal record with a time of 10:55.79. The track team will head to Knoxville, Tennessee, to compete in the Tennessee Relays from Thursday to Saturday. The Panthers won both games in a doubleheader against Boston College Saturday, 9-4 and 6-4, but lost 8-0 against Boston College Sunday. Redshirt senior Matt Pidich got the start in the first game against Boston College Saturday, striking out eight batters and allowing only one run across his 5.1 innings on the mound. First-year outfielder and designated hitter Ron Washington Jr. led the way offensively with two RBIs, and sophomore Nico Popa and junior Connor Perry both added an RBI as well. The game started out with both teams trading runs back and forth. The Panthers broke away with an explosive fifth inning where they registered five runs. In the second game, Washington Jr. led the way offensively again, going 4-5 with an RBI. Sophomore Alex Amos, redshirt senior Frank Maldonado and junior Cole MacLaren all had multi-hit games, too. Amos had two RBIs and MacLaren had one. Junior Yaya Chentouf and sophomores Chris Gomez and RJ Freure combined for 13 strikeouts and six walks throughout the contest. Chentouf’s performance in relief gave him the win on the day. The teams spent the whole contest trading runs. Chentouf’s lockdown work in relief helped the Panthers earn the victory in extras when they were finally able to pull away. The Panthers were unable to pull off the series sweep over Boston College Sunday, losing an 8-0 blowout. Redshirt junior Blair Calvo’s start was short-lived, and he was pulled after 2.2 innings — during that span he allowed two runs and four hits. Sophomore Dan Hammer came in for relief, but he did not last long either, sending just 1.1 innings on the mound. He gave up four runs and three hits. Offensively, it was also a tough day for the Panthers, as they registered just one hit. The team will next face Kent State at the Charles L. Cost Field this Tuesday evening. The game will begin at 6 p.m. The struggles for the tennis team continued as they lost to Clemson Friday, moving their losing streak to six in a row. They now have a record of 6-11 overall and 0-10 in conference. Junior Natsumi Okamoto and first-year Claudia Bartolome captured singles victories after the Panthers claimed the doubles point. Junior Luisa Varon and Okamoto won their match 6-2. Bartolome and junior Clara Lucas sealed the point with a 7-5 victory. Bartolome won her singles match 6-4, 6-3. Junior Gabriela Rezende lost in three sets by scores of 6-4, 0-6, 2-6 to No. 20 Marie Leduc. Frey also fell in three sets, 6-7, 6-4, 1-6. Okamoto won in three sets. She went down 2-6 in the first set, but she rallied and won the last two 7-6 and 6-3. The tennis team will attempt to record their first ACC win of the season against Georgia Tech Friday at home. The spoils were shared between the Panthers and Seminoles during their doubleheader Saturday — No. 13 Florida State won the first game 2-1, but Pitt snapped the Seminoles 36-game ACC win streak in the second part of the day winning 1-0. In the third game of the series Sunday, the Seminoles beat the Panthers in five innings, 8-0. In their first matchup, junior Sarah Dawson pitched a complete game, giving up eight hits and two runs in six innings. On offense, senior Erin Hershman’s bunt led to a throwing error that scored freshman Hunter Levesque, providing the team’s first and only run of the first game. Florida State scored two off of a line drive to win on a walk-off, winning 2-1. 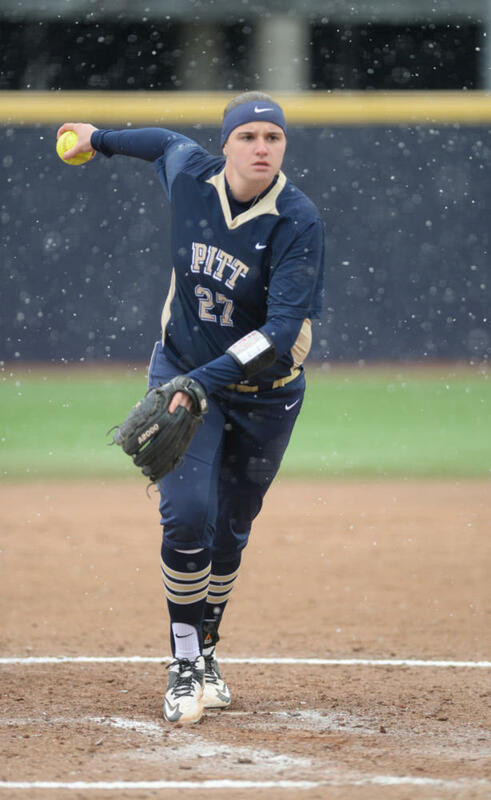 Pitt came back in the second game, though, claiming victory in extra innings. Senior Kayla Harris threw a complete game shutout across eight innings, striking out two. Her two strikeouts came with the bases loaded and no outs in the bottom of the seventh, avoiding another walk-off. In the eighth, junior Marissa DeMatteo singled to start and senior Giorgiana Zeremenko had the game winning RBI single two batters later, finishing 1-0. The Panthers failed to capitalize on the momentum from Saturday’s victory and lost 8-0 to Florida State Sunday. Dawson was given the start, but could not replicate her outing from the day prior. After a six-run second inning from the Seminoles and little offensive output from the Panthers, the game was over after just five innings. The contest was ended early when Florida State scored their eighth run, enacting the mercy rule. Georgia Tech will visit for an ACC weekend series beginning this Friday. The first game will be at Vartabedian Field starting at 5 p.m. The Pitt gymnastics team competed in the NCAA Regional Championship in the St. John Arena at Ohio State University Saturday, placing fifth overall out of six teams and finishing with a score of 195.125. This season — Samantha Snider’s first year as head coach — was the first time since 2013 that the team made the regional competition. On the vault, Pitt scored a 48.950, fifth-best at the competition. The top performer for the Panthers was sophomore Deven Herbine, who notched a 9.850 — good enough to tie for eighth overall. Junior Kensleigh Owens came up next best for the Panthers, tied for 19th and scored a 9.800. Both senior Catie Conrad and first-year Haley Brechwald scored a 9.775 and tied for 24th.